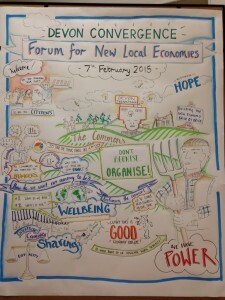 At the recent Devon Convergence: Forum for New Local Economies I was delighted to be reminded of the value of running events with visual artists. These skilful ‘note takers’ (Tem Gunawardena and Camilla Yuil) were both part of the momentum of the day as well as the record keepers, not just of key moments but process and connections formed too. Some words are powerful. 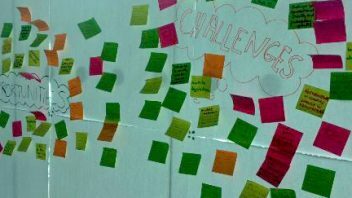 And despite the subjective nature of choosing words, the visual process allowed notable words or phrases to come alive, link to other information: ideas, connections, theories and plans. There are a number of reasons that an emerging Bank of Devon, or the phrase ‘don’t agonise organise’ come to mind when I think of this event. They were both powerful threads of the discussions aided by the developing visuals on the wall. 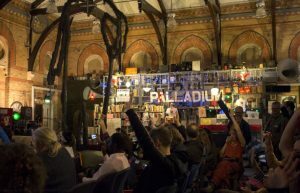 Of course the visual aspect of an event allows a form of documentation of event – these aforementioned ideas and theories. Process is also built in. Because the note takers were participating in the event their drawing was evolving with the event, so inherent in this was the capture of process. Not really the formal process of the day, but something perhaps a bit more organic, the process of ideas and conversation – the elixir of creative conversations and progressive projects. 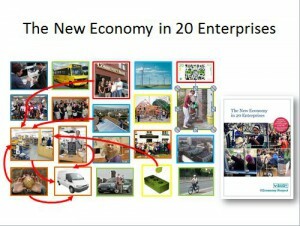 The Devon Convergence is not the only place that has invested in visuals to help deliver a transformative message around changing the way we deal with economy and also other closely related issues. 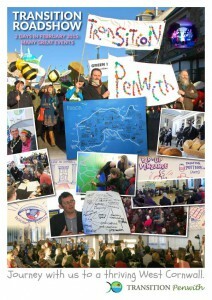 There were visual artists at the REconomy Event run in February with Transition Penwith. A fantastic part of the event itself, the visuals were also done to engage people in the outcomes, having more impact that a report or written document alone. 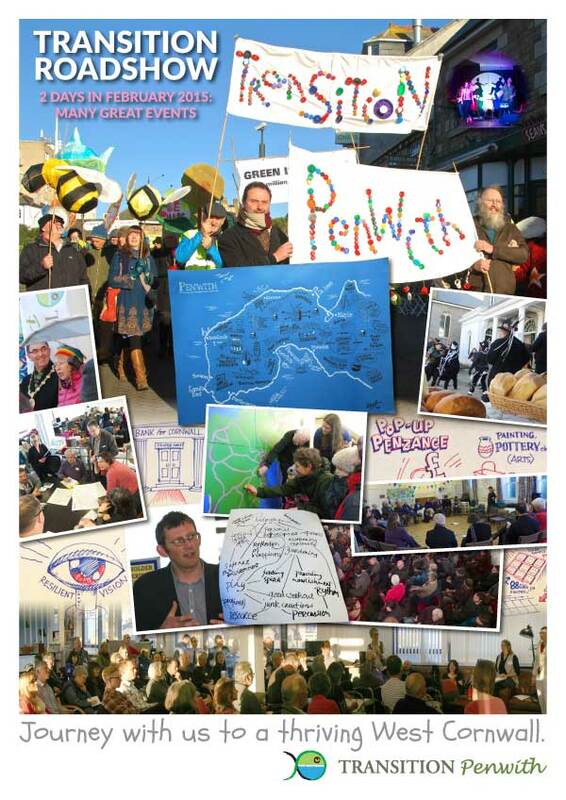 On top of a great event, the group now have images which can act as calling cards, a talk point for Transition Penwith’s work with new members, enterprises and other partners around a forthcoming economic blue-print. To presentation, rather than capturing participation: When RSA launched its animate series the talks quickly became a viral tool for new (and more established) ideas. The live nature of the above examples, particularly from Penwith and Devon, are vital to their authenticity. 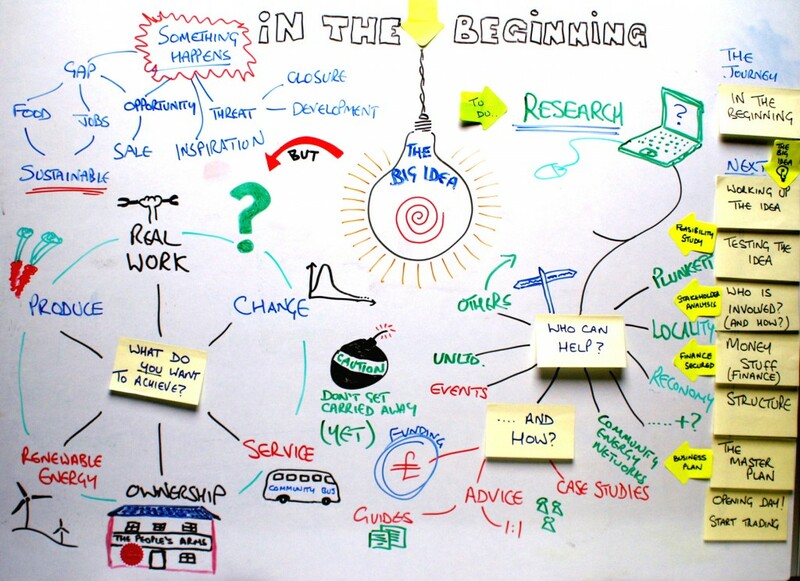 However, a rehearsed video animation alongside a presentation as a means of communicating the story behind a complex idea with visuals is indeed compelling and arguably ensures they reach further than as a presentation alone. If you don’t know what I am talking about you could look at this one about work. At the REconomy event and Roadshow in St Andrews Rob Hopkins was sandwiched between two packed days of workshops and activities. His presentation was full of images, and stories, an illustration of what he has seen and felt with communities all over the world. Whilst Rob was not capturing the event in his talk he was certainly using his power for storytelling and visuals to show momentum and process. 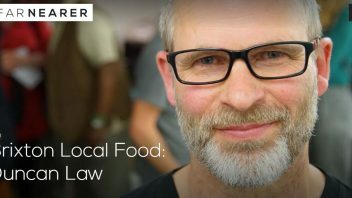 The images have a way of helping you to recall the stories he tells, with the passion he tells them, some month on – useful if you, in turn need to tell that story to leverage the learning from a community in a far off place. Facilitating Learning, Mark Simmonds has produced some great graphics to go with a soon to be released Transition Enterprise Handbook. We have been releasing excerpts in advance on this blog. The Handbook is packed with information and guidance which are summarised and all the more memorable through the visuals images Mark produces. 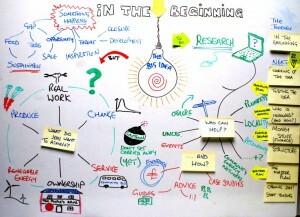 We’d love to hear about the work you are doing to communicate REconomy related practices and ideas through visuals. Do share your links to other work below for us all to see, enjoy and benefit from. 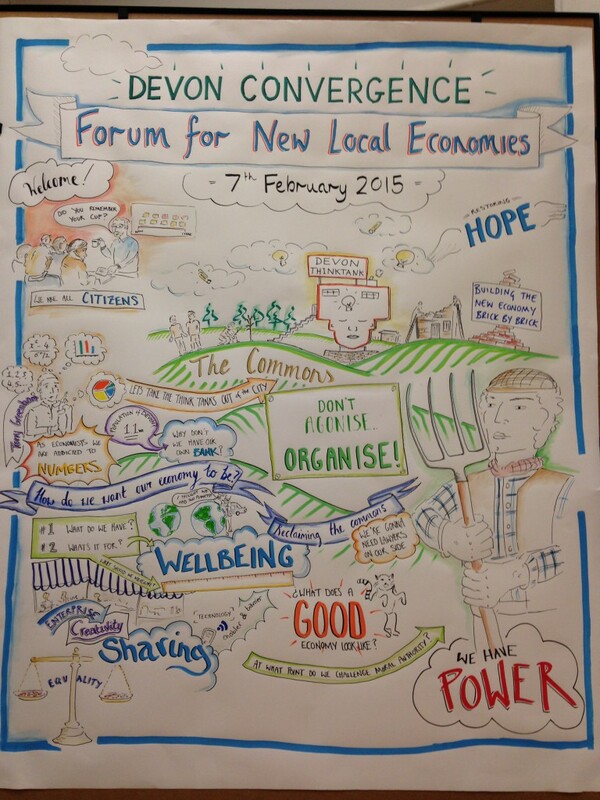 Blog written by Anna Lodge, working with the REconomy Project team at Transition Network. Thank you to Enfable Videographic Storytelling (http://enfable.org/) for making and gifting the video above. 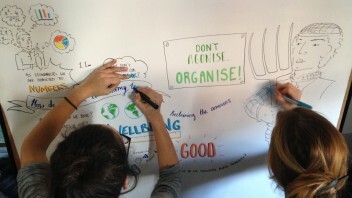 And thanks to George Hardwick for the wRap, and to Tem and Camilla for the visual facilitation. Appreciation and thanks to the organising committee – most of whom undertook the work on an entirely voluntary basis. A thank you, too, to Friends Provident Foundation for their financial contribution to the event, and for the monetary and in-kind donations provided by the organisations and individuals participating on the day.